^ 例：Mackillop 1998 "The Poems' authenticity was challenged from their initial publication, and the originals Macpherson produced to back his claim were fabricated." ^ Margaret McFadden Smith 1989, "it is equally agreed that he never possessed the Gaelic texts that he purported to have translated, especially the epics." ^ Mackillop 1998, "Bogus though he may have been, Macpherson drew learned attention to Irish and Scottich Gaelic traditions.."
^ Mackenzie 1805,p.66, Carlyle からの書簡, "2d day of October, 1759"
^ Macpherson 1760, Fragments, p.vii, "In particular there is reason to hope that one work of considerable length.. an heroic poem, might be recovered and translated, if encouragement were given to such an undertaking." p.viii "the three last poems in the collection are fragments which the translator obtained of this epic poem; .. If the whole were recovered, it might serve to throw considerable light upon the Scottish and Irish antiquities." ^ 前述Mackenzie 1805, Blair 書簡, p.58, "he showed extreme unwillingness to engage in it"
^ Hugh Blair, Disertation, (Machperson 1765, Works of Ossian" の序文) "..the translator collected from tradition, and some manuscripts"
^ Johnson 1775, Journey, p.189 "I believe there cannot be recovered, in the whole Earse language, five hundred lines of which there is any evidence to prove them a hundred years old. 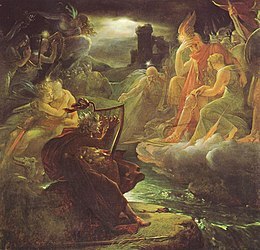 Yet I hear that the father of Ossian boasts of two chests more of ancient poetry, which he suppresses, because they are too good for the English. ^ Boswell, Life of Johnson, Nov.10 "One of his objections to the authenticity of Fingal.. I perfectly recall (that Johnson said) 'Why is not the original deposited in some publick library?..'" ^ Mackenzie 1805, Report, p.4- (David Hume から Hugh Blair への書簡、19 Sept. 1763 日付) "Macpherson pretends that there is an ancient manuscript of art of Fingal in the family I think of Calnronald. Get that fact ascertained .. ";"get positive testimony.. that such poems are vulgarly recited in the Highlands"; 続きの書簡で："..flew into a passion", etc. ^ Bray, Elizabeth (1996) The Discovery of the Hebrides: Voyages to the Western Isles 1745-1883. Edinburgh. Birlinn. ^ Cambpell 1862, J. F. Campbell, Pop. Tales, 第4巻: "In 1807, after MacPherson's death, the Highland Society of London published certain Gaelic manuscripts which were all in MacPherson's handwriting. These contained Gaelic poems, and are the equivalents of nearly the whole of his English prose." ^ Mackenzie 1805, Report, 英訳 p.277- (この人物の証言の原文はゲール語) "he remembers well that Clanronald made his father give up the red book to James Macpherson from Badenoch; taht it was near as thick as a Bible, but that it was longer and broader, though not so thick in the cover." ^ Mackenzie 1805, Report, Andrew Gallie書簡、p.32, "I communicate from you a few stanzas, taken from the manuscript: Bha fer fer.."
^ MacLauchlan 1862, Dean of Lismore's Book, Skene の序文, p.lvii, 脚注1 "I [was near] Strathmashire, and.. informed.. by whom I cannot now [remember], that, after Lachlan Macpherson's death, a paper was found in his repositories containing the Gaelic of the seventh book of Temora, in his handwriting, with numerous corrections and alteration, with this title, -- "First rude draft of the seventh book of Temora." ^ MacLauchlan 1862, Skene 序文, p.lvii, 脚注1 "This Gaelic version..put together before 1767; and if before 1762.. will account for.. an advetisement which appeared soon after the publication of the second quart o (=Temora), that the originals were lying at the publisher's, and would be published if a sufficient number of subscribers came forward." ^ [[#CITEREF|]], vol. 4, "At p.57 of this introduction, Mr. Skene supposes that Mac Pherson's Gaelic text was prepared in Badenoch about 1760, after his return from his Highland tour, with the aid of Lachlan.. and Captain Morrison, and that the English was translated from that text. My opinion now is that Mac Pherson's Translation was first composed by a great genius, partly from a knowledge of Scotch nature and folk-lore, apartly from idas gathered from books; and that he and other translators afterards worked at it, and made a Gaelic equivanent whose merit varies according to the translator's skill and knowledge of Gaelic." ^ Henry Home (Lord Kames), Sketches of the History of Man, (new edition, Edinburgh, William Creech, 1807, volume 1, p.344 "The translator (Mr Macpherson) saw in the Isle of Sky, the first four books of the poem Fingal, written in a fair hand on vellum, and bearing date in the year 1403. ^ 例: Thomson, The Gaelic sources of MacPherson's "Ossian (1952), p.106, "St. Patrick asks Oisein to tell him about the narrowest straits the Fian were ever in. That Macpherson knew this verse "
^ Boswell & Pottle 1950,"susceptible of tormenting love." ^ Boswell & Pottle 1950,p.228 "Macpherson.. said he had no relish for anything in life except women.."
^ Boswell & Pottle 1950,(Signet 版p.231)Blair: (asked) why he was so fond of staying in England, as he surely could not like John Bull. "Sir," said he, "I hate John Bull but love his daughters." Campbell, John Francis (1872), Leabhar na Feinne, 1, London: Spottiswoode (Volume 1 = Gaelic textsgd: Heroic Gaelic ballads collected in Scotland chiefly from 1512 to 1871, copied from old manuscripts preserved at Edinburgh and elsewhere, and from rare books, and orally collected since 1859; with lists of collections, and of their contents; and with a short account of the documents quoted). 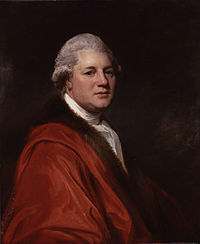 Johnson, Samuel (1775) (google), A Journey to the Western Islands of Scotland, Dublin: J.Williams, http://books.google.co.jp/books?id=oE0DAAAAYAAJ "